With a super soft colourful plush, this adorable dino not only looks good, but gives the warmest of cosy hugs too! 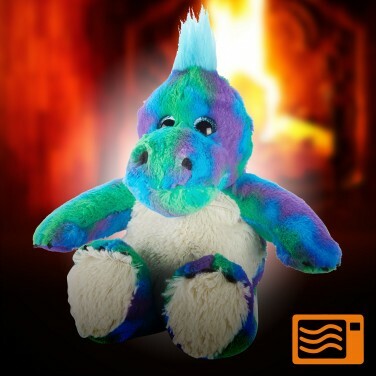 Bright, colourful and incredibly snuggly, this cute dino can be popped in the microwave to give the warmest of hugs! Filled with treated millet seeds and lavender, just 90 seconds in the microwave is all it takes to warm this cute character who will ooze warmth to helps soothe little ones, warm beds and even help to alleviate aches and pains with warmth and calming lavender scents. Just like a hot water bottle this cuddly dinosaur isn't classed as a 'toy' so if giving to a very young child it should be used under adult supervision and caution should be taken to not get too hot before giving to little ones. Soft and snuggly, Chico the Chihuahua can be placed in the microwave for the warmest of snuggly hugs!